Last night, I was invited to Christmas Dinner at my friend Alex's house. 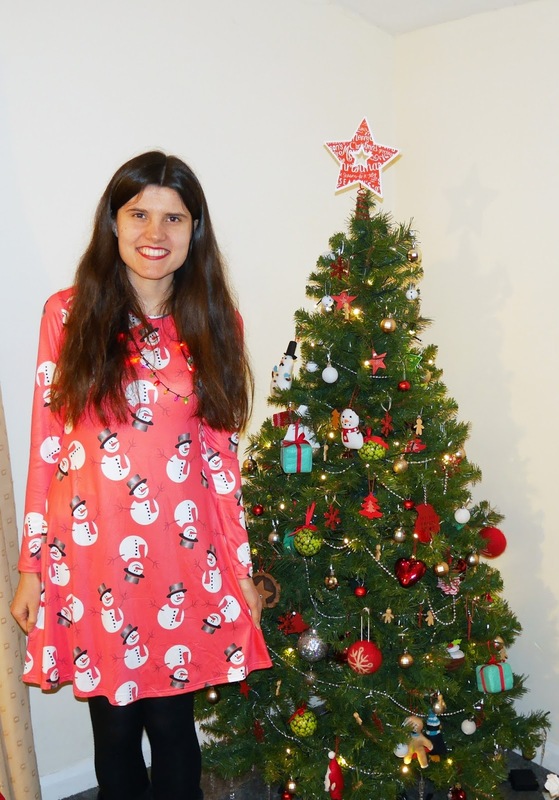 Alex is a huge fan of Christmas and she's also a great event organiser, so I was really looking forward to seeing what she had planned for the evening. I decided to wear my new Snowman dress and accessorise it with my flashing fairy lights necklace that my Mum bought me. I arrived at Alex's after a hectic day at Uni. As soon as I walked in, I saw the wonderfully decorated red and white-themed table and her brilliant Christmas tree. 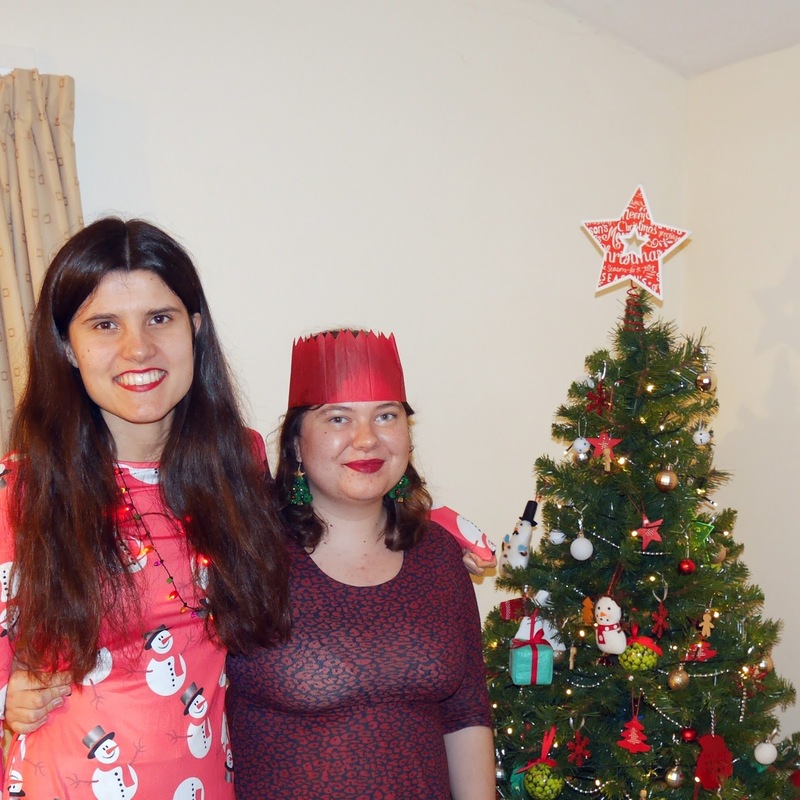 Alex has a full size Christmas tree in her house, which is really cool for a student house! 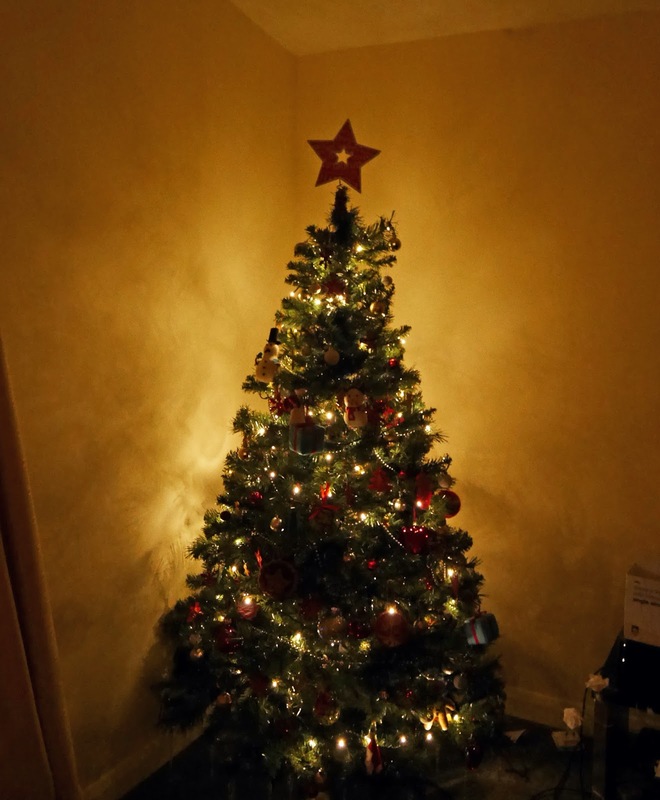 She even let me hang up the fairy lights, which made me very happy, as I haven't been able to help decorate the Christmas tree at home this year. As there were four of us having dinner, we each brought something to share. I brought soup for a starter, Harry brought fancy bread and Beth brought the prosecco. For the main course, Alex cooked an incredible feast! There were all kinds of meat, roasted vegetables and even the green classics, such as broccoli and brussels sprouts. 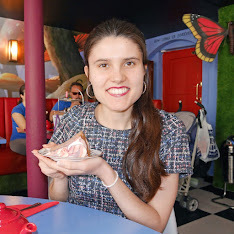 For dessert, we had chocolate cheesecake and although we could only manage a tiny bit of it, it was a great way to finish the evening. After lots of laughter and a few photos in front of the Christmas tree, it was time to head home. It was such a lovely evening. 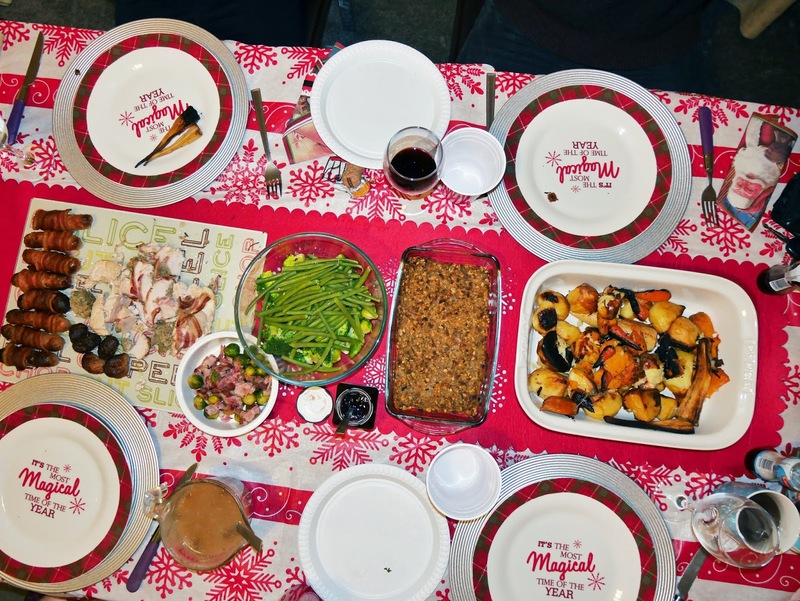 Do you have any experiences of Christmas dinner at University? What food did you cook? 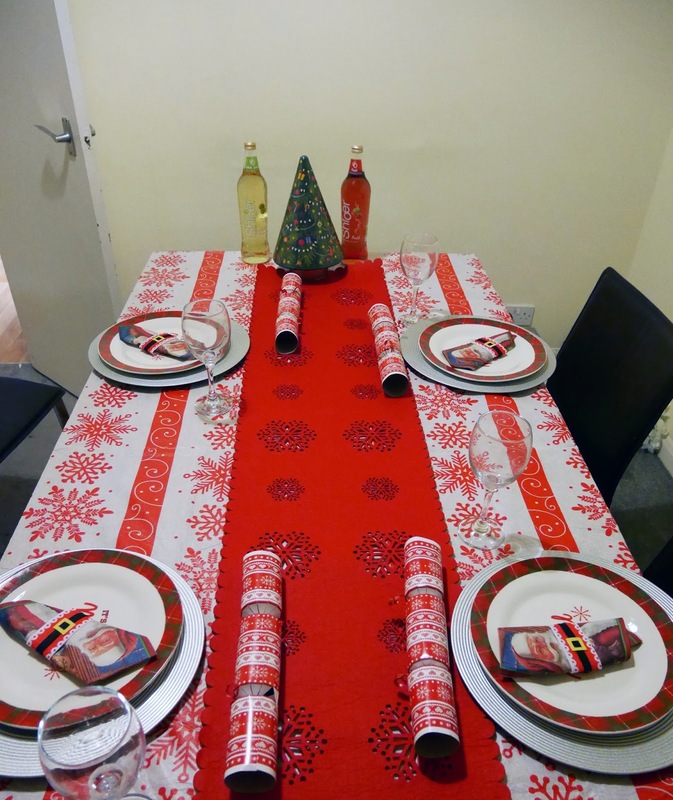 It's my first Christmas at unversity this year and my flatmates and I blocked out a whole day. We're going to make it like a proper Christmas day. Obviously a Christmas dinner, but also secret santa, games and music. I'm really looking forward to it! That tree is beautiful and such a lovely things to do in university - so lovely that you all shared the feast!